Last week, I reviewed a beautiful and instructive little book on stumpwork embroidery, called Stumpwork Flowers. 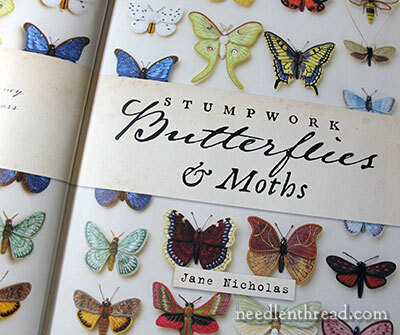 This week, continuing with stumpwork books, I want to show you Jane Nicholas’s latest book, called Stumpwork Butterflies & Moths. 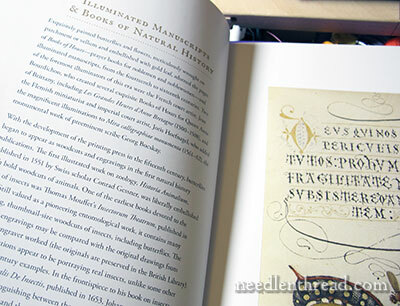 It’s just out, and, if you love stumpwork, butterflies, insects in general – well, it’s a corker! Jane Nicholas’s new books is a combination of technique, instruction, artistry, and education. It’s the type of book that you can leave on your coffee table. You’ll find that you, the embroiderer, are not the only person who likes it – anyone interested in nature, art, and beauty will be drawn to pick it up and browse through it. And if you happen to have a Lepidopterist or an Entomologist in the family, the book will not go unappreciated! 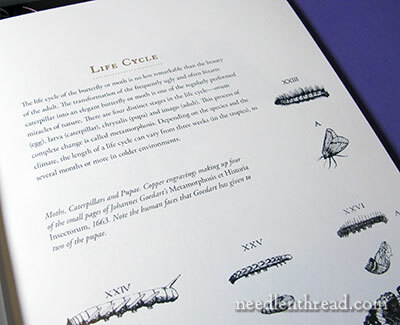 The introductory pages will have you gaping at the extraordinary detail and lifelike-ness of the moths and butterflies featured here. See, I’m not a bug lover. I appreciate a pretty butterfly, and I marvel over the extensive variety of bugs in nature, but they are not something I’m drawn to, to study or embroider. Occasionally, sure, a butterfly in a garden, a ladybug on a leaf, bees buzzing hither and yon – that’s fine. But I never thought I would want to spend time studying and embroidering all kinds of varieties of butterflies, moths, or bugs in general. Until now. This book will sell you on the idea! 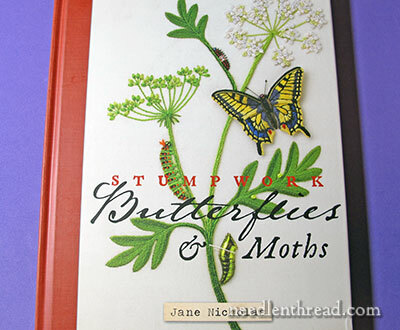 Stumpwork Butterflies & Moths is about butterflies and moths, but not just the stumpwork kind. The table of contents above shows you that the book is divided into five parts. The first three parts are devoted to a study of butterflies and moths, including their natural history (what they are, how they live, reproduce, grow, and so forth), their use in ornament, and that strange wonder, the specimen box. 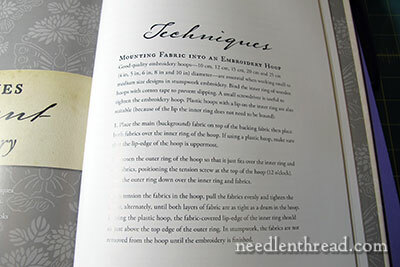 Part Four is devoted to the projects in the book – think of it as your own stumpwork specimen box – and Part Five is devoted to techniques, stitches, and other information for the embroiderer. You can see, then, that the book is more than a stitchery book. 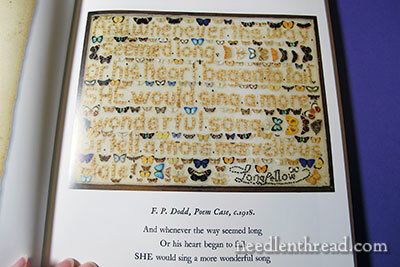 Understanding the creature itself, its use in art and design throughout history, and its allure for the collector will all contribute to the embroiderer’s ability to translate thread into a realistic butterfly. In the first three parts of the book, Jane teaches us all about butterflies and moths so that we can better appreciate their beauty and be more aware of the intricacies of butterflyness. The book is really well done. It’s beautiful to read, to browse through – there are heaps of gorgeous images supporting all the text. I love this section on the Butterfly as Ornament. Here, you’ll see the artfully rendered butterfly in all its glory! 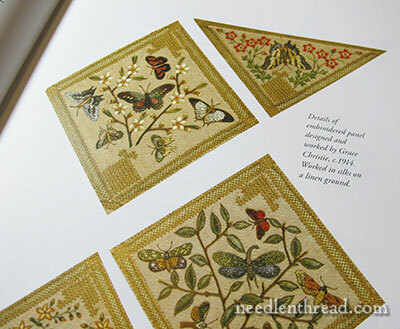 …and you’ll see some gorgeous examples of embroidered butterflies by great embroideries like Grace Christie. The section on the specimen box serves as a kind of transition in the book. 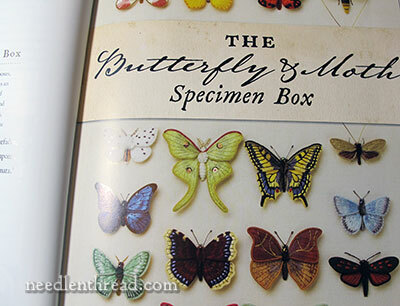 Jane takes us through the notion of collecting and cataloging butterflies, and we see the specimen box as a work of art. There are some gorgeous boxes featured here! One that drew my attention right away is a specimen box by F. P. Dodd, Australian entomologist, in which he quotes a verse from Longfellow’s lovely little poem written for the fiftieth birthday of Louis Agassiz, who was a Swiss biologist and geologist who eventually ended up a professor at Harvard and a close friend of Longfellow’s. It’s such a pretty little poem, and though there are several personal references in it, most of it has a universal appeal in the appreciation of Nature – especially the verse quoted by Dodd. You can read the whole poem here. It’s an amazing work of art, and the butterflies in it are spectacular – their colors are vibrant and glorious! 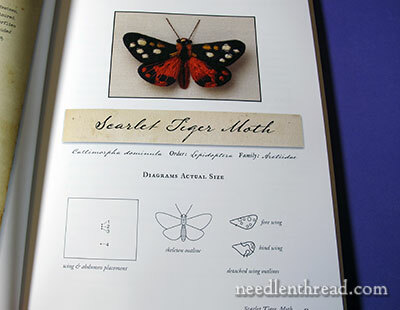 As I said, the specimen box section is a transition into the stumpwork butterfly – where we create our own little specimens using needle and thread. 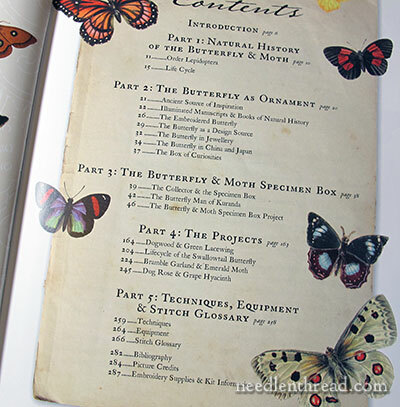 There are 18 butterflies and moths in Jane’s specimen box, along with instructions for reproducing them. For each specimen, you’ll find a pattern for the overall critter, plus a breakdown of its parts. 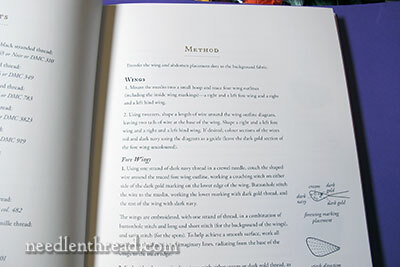 You’ll find a complete list of requirements for stitching the butterfly, including thread types and colors (some are specialty threads, some are silks, some are metallics, etc.) and other notions, wires, and so forth needed to make a stumpwork butterfly. The requirements are followed by the method of stitching and constructing the butterfly. You can see in the photo above that the majority of instruction is text. The text fills the page, with small images along the margins to show you the development of the piece. In the last part of the book, we find the techniques more thoroughly explained. This is where you’ll find specific instructions, like how to set up your project and how to do specific stitches. I love Jane Nicholas’s books! They’re beautiful, they’re instructive, they’re inspiring! But they aren’t necessarily for beginners. If you have never done a lick of stumpwork before, or if you are just starting out in embroidery, they probably aren’t the books for you, unless you’re absolutely determined. (I’m of the mind that any beginner who is absolutely determined to learn something can indeed do it.) But for beginners who are expecting step-by-step photos of every single aspect of the process, they aren’t that kind of book. You might try a book like Stumpwork Flowers first, and then move into Jane’s books. In the US, you can find Stumpwork Butterflies & Moths available now through Amazon. 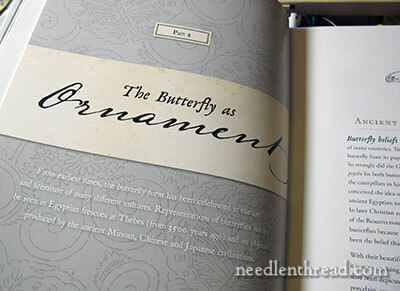 Worldwide, you can find Stumpwork Butterflies & Moths through Book Depository, with free shipping. 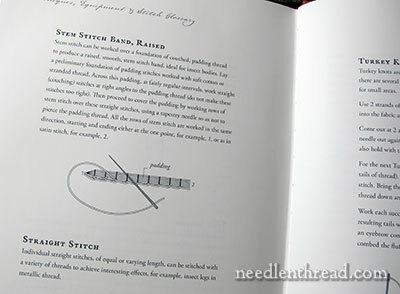 If you’re looking for other types of embroidery books, you’ll find a whole slew of embroidery books reviewed here on Needle ‘n Thread, so that you can know what’s in them before you buy them. 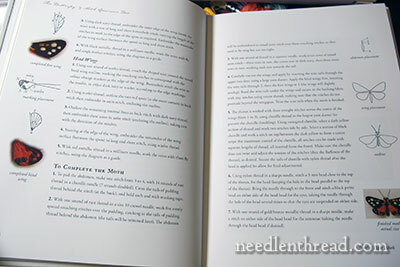 Feel free to check out my Embroidery Books index, where you’ll find links to all my reviews. Wouldn’t it be interesting to combine these gorgeous butterflies with their food plants and flowers…? Ha-ha! You beat me to it, I was going to review this one! True, true, Elizabeth! You always know you’re getting a good quality, beautiful book when it’s written by Jane Nicholas! 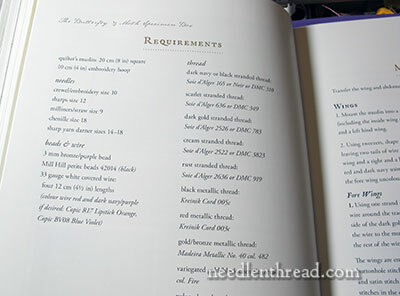 Regarding “If you have never done a lick of stumpwork before, or if you are just starting out in embroidery, they probably aren’t the books for you”. I’m still a novice/rookie/beginner but I placed this on my wishlist. It will inspire me to improve and when I get discouraged, it will lure me to rip it out and try again because I would love to do this someday! Thanks for sharing because it’s not a “look inside” book on amazon and you can’t tell a book from it’s cover. Good point, Sandra – nothing like a good book for providing inspiration! I was lucky enough to take a class from Jane when she was teaching in the US a few years ago. It was a project from her Turkish Tiles book and turned out absolutely gorgeous. You are quite right, she doesn’t seem to have beginner projects, for that, try some Jan Kerton projects, but they are hard to find in the US. Will definitely have to get this book. BTW, Jane will be teaching at the EGA seminar in October 2014 in Phoenix, Arizona, for those of you lucky enough to attend. Registration is now open, I believe. The photos of the butterflies and moths are beautiful, it looks like an interesting read on natural history as well as an informative and instructional book on embroidery and brings the butterflies and moths a live such colours wonderful. Thanks for the photos and sharing the book with us. Off subject. You use the word “corker”. I’ve never heard anyone but members of my dad’s family use it. German/Irish heritage. Curious if it is comon in Kansas. Hmmm. I think I picked it up from some Australians! It’s probably not too common in Kansas…. What a corker of a guess Mary. It’s certainly not uncommon down here. Wow – what a work of art and love! I so appreciate other people putting together books like this that can be useful and used for many many years. Thanks for sharing that, Mary. Hello Mary, thank you so much for this introduction to Stumpwork, and the links to the books. I’ve just persuaded o/h that I can have an early Easter pressie, and ordered them! Even if I don’t get round to trying it, the books will be lovely to look at. I’ve some of Jane’s books and this one looks beaut too. I’m a bug person. Can’t leave an interesting dead one to the elements. Into the collection it goes, with leaves, shells, stones, mossy sticks etc. Love them and of course butterflies. They never cease to amaze me. Thanks for the review. Delish. I LOVE her books, and had ordered it already. Realized today that altho it says it arrived I never received it!! So hopefully I’ll get it replaced with no problem. 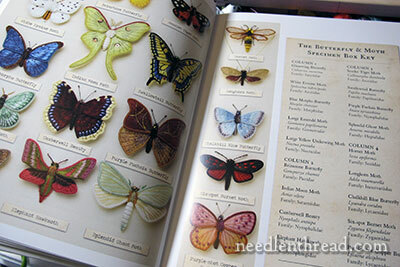 I have her beetles and dragonflies books and just love them. Also love Jane Hall’s books as well. They are also gorgeous. Thanks so much Mary for your book reviews. You are hard on my pocketbook (I have no self control on books, LOL) but I LOVE your reviews and they really help me to find some great books. Ahh, I have this book. Thank heavens. When you mentioned a fascinating book review earlier this week I thought I had to be strong and resist any temptation to buy. However, if I didn’t have the book aleady, I’d have to relent. Jane is a fabulous teacher and explains everything, step by step. Her book is just as she is, plus pictures! Take heart, be courageous; just give it a go and try. I did. Hi Mary, I just bought this book and I am one of those determined beginners you talk about. I have taken Arlene White’s Beetle class on Stitchen Fingers recommendation and loved it! I am now starting on a small owl brooch in Jane Nicholas’s complete book of stump work embroidery. I am determined to learn and am grateful I have found many friends to answer my questions. I do have basic embroidery ability and have been cross stitching and doing black work for years. I also have done surface embroidery and a Brazilian embroidery class years ago.